Update 17-Jun-2012: Fixed some typos, the broken formatting in some of the code and the missing types after static_cast and dynamic_cast operators, and updated the code snippets to reflect two bug fixes. 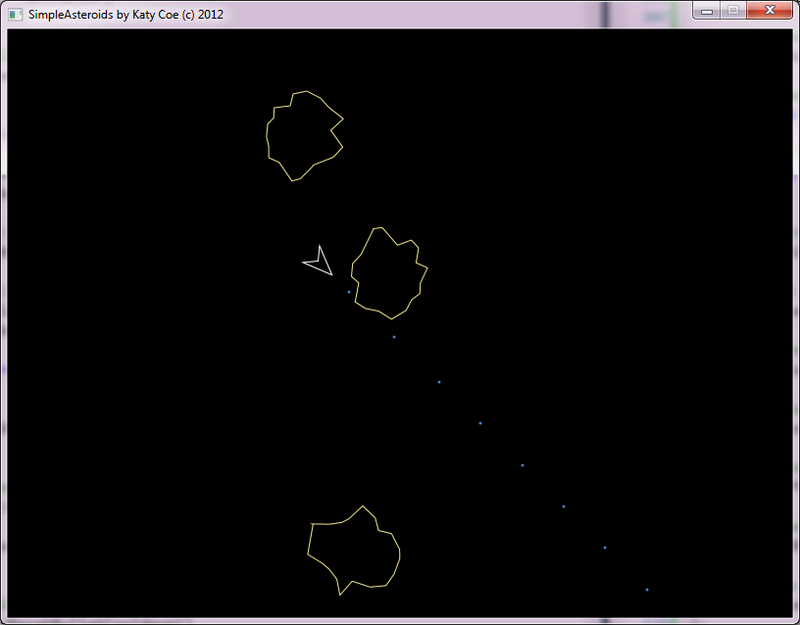 Update 18-Jun-2012: Wrote the final section regarding the implementation of shields and waves. The sun is shining brightly, it’s nice and warm outside and unbearably hot in the office, I didn’t manage to fall asleep til 7 this morning and people are asking me to go to the beach. This, of course, can only mean one thing: it’s time for another coding challenge! …all of which basically means that significant portions of the game have to be engineered using different techniques to Tetris, which I thought made it a good 2nd-stage challenge for beginning game programmers to follow along with. Be prepared for some mathematics today: we are going to be needing some basic vector algebra and trigonometry. Yes, they say you don’t need to be good at math to be a good programmer, but unfortunately if you want to be a game programmer, you do need to have a decent grasp of it, there is no getting around it I’m afraid! Note that DirectX provides a math library which handles this kind of stuff for you, and re-inventing the wheel is bad, however for the purposes of this demo I will code in the actual math so that beginners can see how it’s done, as it’s important to understand what is actually going on before you abstract it away. Some ground rules: as with Tetris I will use my Simple2D graphics library for the rendering, and the game will have a similar kind of programmatic structure to Tetris, but I won’t copy and paste large chunks of code from Tetris as that would be cheating for the purposes of a challenge. Once again you’ll need the Visual C++ 2010 Redistributable Package to follow along with each step, and as before I will post the source code and EXE after each step. This creates a closed path geometry with 4 lines forming an arrowhead-type shape, starting with the tip of the arrow and going clockwise around the shape. Unfortunately, this takes the user’s key repeat speed settings into account, meaning that you don’t get a smooth rotation of the ship until the repeat kicks in. If the user holds down an arrow key here, the ship will rotate slightly, then there will be a pause until the key starts to repeat, and the ship will then rotate in a discrete ‘jagged’ kind of motion on each repeat cycle. This works but now the problem is since we are checking the keyboard directly and not reading buffered keypresses from a queue, this makes ship rotation speed dependent upon the game’s frame rate. The real solution is to run this code in another thread in an infinite loop with a sleep timer to determine the speed of the rotation, however we are being quick and dirty here so we’ll casually ignore this problem for now. The game should not be so computationally intensive that the frame rate slows down anyway. I’m starving. I want BACON! Back soon. To allow the ship to accelerate, we give it a velocity vector which tracks the x and y movement speed of the ship. On each frame, the velocity vector is added to the ship’s position vector to get its new position. When you press the up arrow to make the ship accelerate, a normalized vector (magnitude of 1) representing the current direction of movement is added to the velocity vector, multiplied by a fixed scalar acceleration factor which lets us control how fast the ship should accelerate. We could use polar co-ordinates to do this (two scalar values: an angle and a speed), but I have chosen to use Cartesian co-ordinates as described above (a vector). Both have their advantages and disadvantages. One of the great things about adding a vector with the direction of movement to the velocity vector is that adding two vectors pointing in the same direction increases the vector’s magnitude (“strength”), whereas adding vectors pointing in opposite directions cancel each other out. This allow us to simply code a very fluid ship movement. So far, the ship will continue to move indefinitely once it starts moving at all, until you accelerate in the opposite direction. Some Asteroids implementations are actually like this, however I prefer to bring the ship to a standstill if the accelerate key isn’t pressed for a while. Of course we can’t make the ship stop immediately when the user lets go of accelerate, it has to skid gradually to a stationary position. To do this we apply a per-frame deceleration (that is, acceleration in exactly the opposite direction of the velocity vector) which very loosely simulates air resistance. For this I have used a simplified version of Stokes’ Law, which is appropriate for rigid bodies moving at relatively low speeds through fluid materials such as air or water. In Stokes’ Law, the rate of deceleration of a body is directly proportional to its velocity; in other words, the faster our ship is moving, the faster it will decelerate, which is exactly what we want. The amount of deceleration is chosen by a so-called drag co-efficient which is simply a constant scalar value which is multiplied to the velocity vector (and negated) to get the deceleration vector. Note that we apply the deceleration directly to the velocity vector so that on subsequent frames the movement of the ship becomes gradually less and less. It is not applied directly to the position of the ship as this would only give a fixed decrease in velocity that would be the same every frame. Note we use the rectangular bounding box of the ship after it has been rotated and positioned to determine whether copies must be drawn. Since the game is written in an object-oriented way, we create an Asteroid class which is instanced one time for each asteroid in the game world. 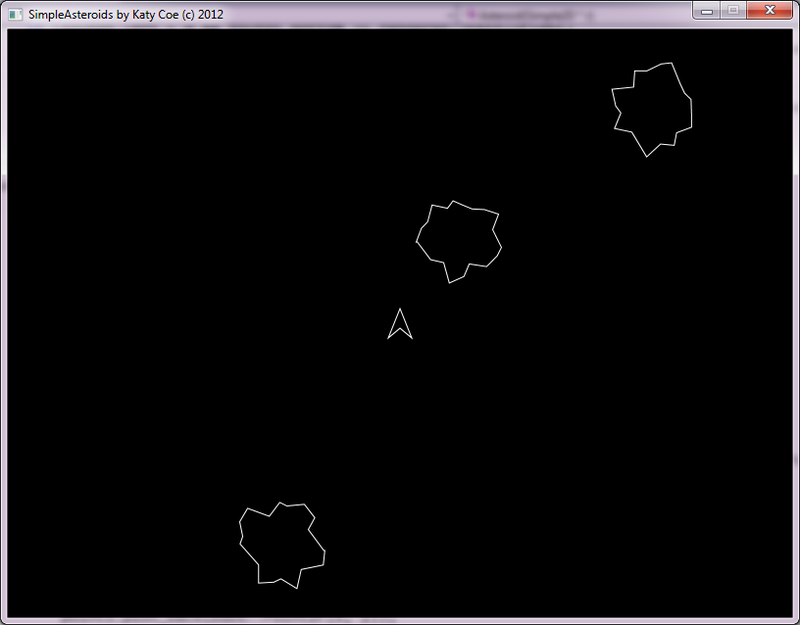 The asteroids are stored in a C++ standard library vector and initialized at the start of the game. The description of the Asteroid class is remarkably similar to that of the ship, and once we start to see repeated code in the drawing, object updating, setup, pulldown functions and so on (as you will see in this version of the source code), and taking into consideration the shared characteristics and problems of each, together with the realization that bullets will also follow the same pattern, and this is a clear case for sub-classing, which I will perform as a re-factor in the next step. The rendering problems of edge and corner detection are the same for asteroids as the ship, but I have not bothered to implement the fix in this version, instead I shall make a base class in the next version that handles it for all game objects. There are five variables at play here and tuning them can have dramatic effects on the appearance of the shapes generated (see screenshots below). So how does it work? First we imagine each asteroid as a circle. Then we imagine a series of concentric circles inside and outside of this (ie. with radii both smaller and larger). We then want to deform (move) a number of points on our circular asteroid to intersect (lie on) one of the inner or outer concentric circles at random. We then join these points up with straight lines to form the final shape. First we select how many points to deform with the granularity variable: the more points, the more geometrically complex the final shape will look. The values minRadius and maxRadius determine the smallest and largest possible radii of the imaginary concentric circles onto which points will be deformed. If these are the same, all of the asteroids will be circular; consequently, the more they differ, the more sharp and jagged the object will look. While we pick precisely granularity points to deform, we do not necessarily want them to be evenly spaced along the circumference (an equal angle between each point on the circle). The variables minVary and maxVary have percentage values from 0-100 which choose how far the actual chosen point can deviate from the point that would have been chosen if they were all equidistant along the circumference (before deformation). 50 is half-way along the segment in which a point is being chosen to deform, and represents the equidistant point. Therefore if minVary and maxVary are both 50, all the points will be equidistant. Values of 0-49 represent anti-clockwise movement of the point and 51-100 represent clockwise movement. A chosen value of 100 on a given segment the same point as a chosen value of 0 on the next segment, and it is for this reason that 0 and 100 are not good choices for the two variables, as they can cause weird overlapping vertices (see the first screenshot below). The values shown above are the ones I eventually settled on after some trial and error. The remainder of the code stores the geometry (joins the points together), and gives the asteroid random initial position, velocity, angle and rotational speed. First of all I have re-factored the code as promised so Players, Asteroids and now Bullets all derive from GameWorldObject which handles all the motion updates and rendering (this probably took about 30 minutes). I have also had to modify Simple2D to work with elliptical geometries for the circular bullet shape (this took about another 30 minutes). This draws the ship, the asteroids and any active bullets. 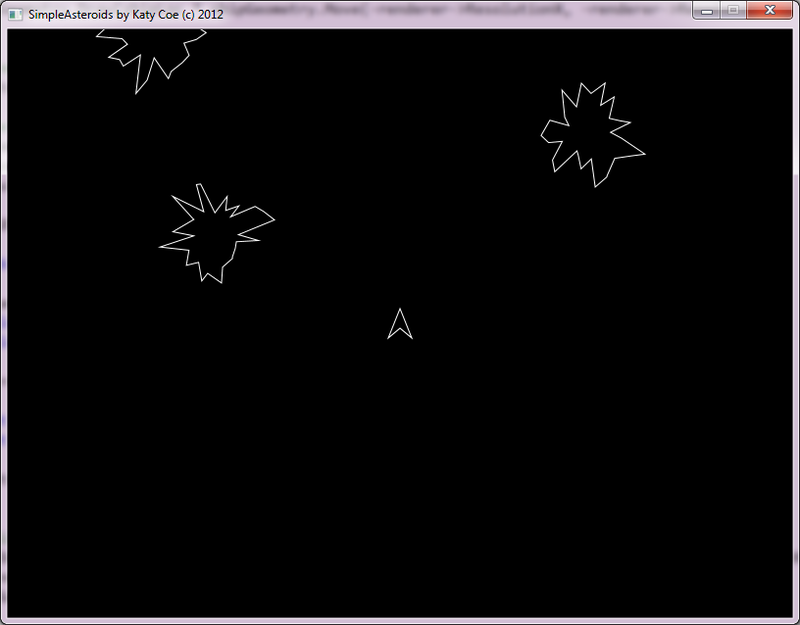 Compare that to the carnage of SimpleTetris’s main drawing function. Bullets are essentially nothing more than small pieces of geometry that come into existence, moved at a fixed speed and direction for a while, then are removed from the scene. The duration a bullet can stay active without colliding with anything before it is removed is called its TTL or Time-To-Live (ironic eh?). Note this is a bit fudgy: only one item at most will be removed per frame. Vector iterators become invalid when you delete something, and even naively resetting it to worldObjects.begin() inside the if block will trigger an exception (even if it worked that’s not a good idea for any sizable game by the way, because every single object in the game world will be iterated over again, possibly multiple times if there are several objects to remove). There is probably a lesson here about selecting the right container type in the first place (ie. one that has non-invalidating iterators on erase), but we don’t have time to be pedantic! When the player holds down fire we don’t want an insta-stream of bullets, there needs to be a gap between them. As in classic Asteroids, there should be a maximum number of bullets on-screen at once. To solve the first problem, we can think of firing like a spell in an RPG: once cast, the cooldown timer must expire before it can be cast again. The exception is if the user releases the fire button, then we want the cooldown to expire instantly so they can hammer the fire button to fire faster than if they just held it down – a mechanic traditionally found in these sorts of games. The second problem is more subtle. As I mentioned earlier, I’m trying to keep all player-related data in the Player class so that it is easy to add multiplayer later. This means each Player object should have its own count of how many bullets have been used and when the last one was fired, and the main game logic class SimpleAsteroids shouldn’t know anything about it: it should simply figure out whose fire button has been pressed and ask that player’s object for a new bullet. The issue with storing this per Player object is that we then have to consider whether we want the Bullets to belong to each Player or to the main class with all the other GameWorldObjects. The former is more logical, however it leads to then duplicating a bunch of object update and drawing code (for loops, at least). The latter keeps all rendering and physics iteration logic in one place, but necessitates that a Bullet has the ability to track which Player it belongs to (since the Players aren’t keeping a list of Bullets they own) so that when it expires it can inform that Player that one less bullet is now being used than before. Three things to note here. Firstly, I’m not a big fan of allocating dynamic memory and returning a pointer to it in the context I have used here. There are other ways to do it and I avoided this kind of thing in Tetris, it feels fragile to me, but, it does work for now. Secondly, you may wonder why I used max instead of just subtracting one from bulletsUsed. Consider the scenario when you lose a life: the ship will be reset, including having its bulletsUsed changed to zero, but there may still be un-expired bullets on the screen. One solution is to remove them all, but I prefer to temporarily allow more than the maximum. The upshot of this is that when bullets expire very soon after the ship is reset, you would end up with a negative value for bulletsUsed without the max trick. Thirdly, attention all you C++ newbies! You have to use a virtual destructor for the ~Bullet() code above, since it is stored as a pointer to GameWorldObject and if you don’t make the destructor virtual it won’t be called and your bulletsUsed counter will never go down! Be warned! 20:52 – It took me 30 minutes to blog that last section. 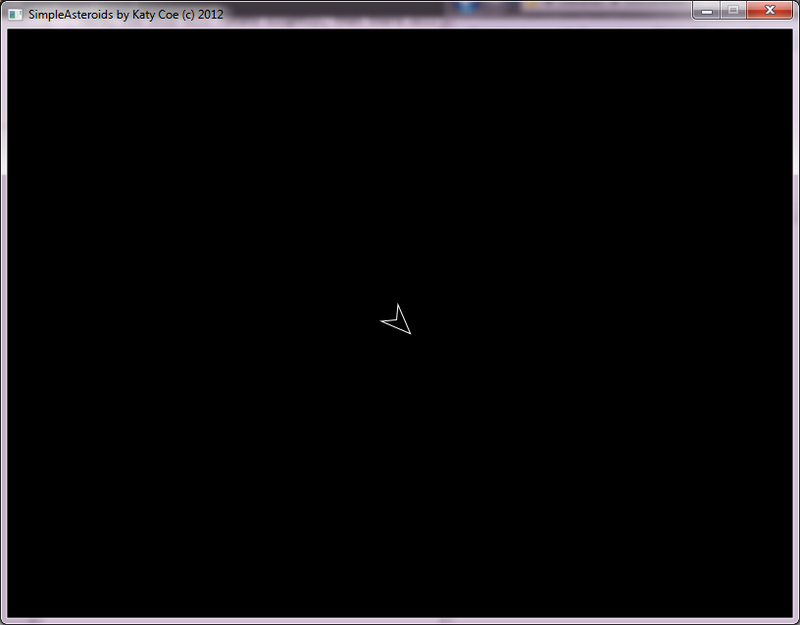 I’m not even considering starting on collision detection til I’ve had some fresh air and a smoke. Note that extra parameters have been added to Asteroid‘s constructor to enable the position and velocity to be pre-set. But, as we see here, both the strengths and flaws of heterogeneous containers are highlighted. Yes, they made looping over everything easy when we didn’t need to know what the derived type was, but when we do, not only do things get messy with unwanted run-time type reflection, but in a larger game we could be iterating through thousands of objects we don’t want of the wrong type just to find a few that we do. Lesson: just because it was a good class hierarchy to have a basic game world object that everything else derives from, doesn’t necessarily mean that they should then all be stored in a single heterogeneous container when a family of homogenous containers may be better (and in this case probably is). On the other hand, I have changed the game world object map from a ptr_vector to a ptr_list – this doesn’t invalidate any iterator on erase except that for the erased item, but more importantly it allows constant-time insertions and deletions in the list in exchange for sacrificing random access, which is a boon. YMMV. // NOTE: It is the responsibility of the application to free this geometry! Note that these various transforms relative to the objects, game world co-ordinates and render target have to be done before using Direct2D’s CompareWithGeometry interface bceause the geometries themselves are stored unrotated, unscaled and untranslated in our Asteroids code – the transformations are only applied at render time, so we have to repeat them for off-screen use when performing the collision detection. 22:38 – Don’t kill the compiler, kill the player. 45 minutes left as I write (23:15). Collision with the ship and the asteroids basically works the same as collisions between bullets and asteroids – a smart and sly reason to use Direct2D geometries for everything instead of just points or little circles for the bullets which would have to be handled differently. The ship must disappear from the game world temporarily. In some implementations the asteroid also gets destroyed (or split into two smaller chunks where applicable) but I have not gone for that approach tonight due to the obvious time constraints. You must lose one life. Therefore we need to add in a system that gives some lives in the first place. Once again we will tie this with the ship and not to the core game, so that in a multiplayer scenario each player can have a different number of lives remaining. If there are no lives left, the game must stop. This means we have to alter the part of the game that updates all the objects and checks for keypresses to only do so if the game is still in progress. After a short interval, the ship should re-appear in the middle in its default orientation and not moving. This update includes all of these things. A state flag is kept to check for the game over condition and is updated whenever the player loses a life. A basic scoring system is also added whereby you get 10 points for shooting a big asteroid, 50 for a medium-sized one and 100 for a small one. We also need to render an overlay showing the player’s lives and score of course. // Set up object position, speed etc. 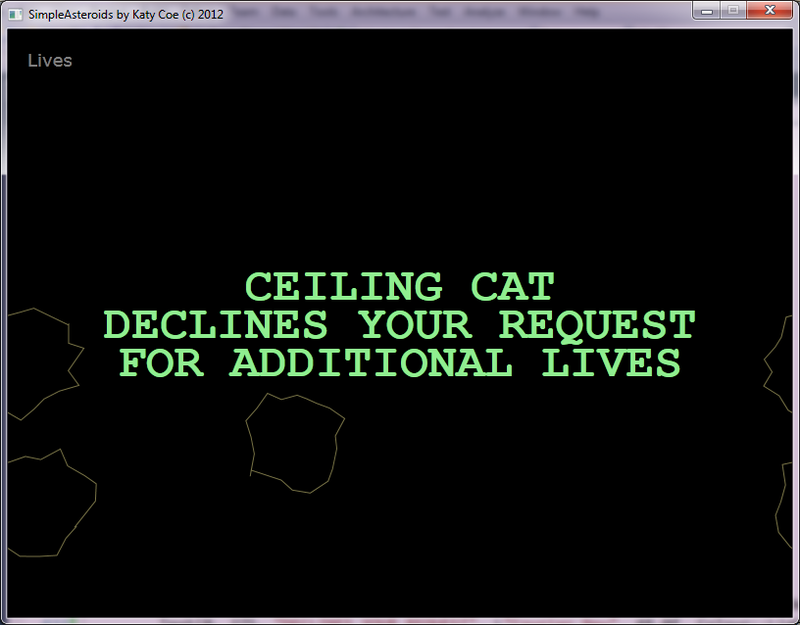 The drawing and collision detection functions are modified to do nothing if the object is currently inactive. The only change to Reset() in the ship code from before is that the number of lives remaining is decremented each time it is called. 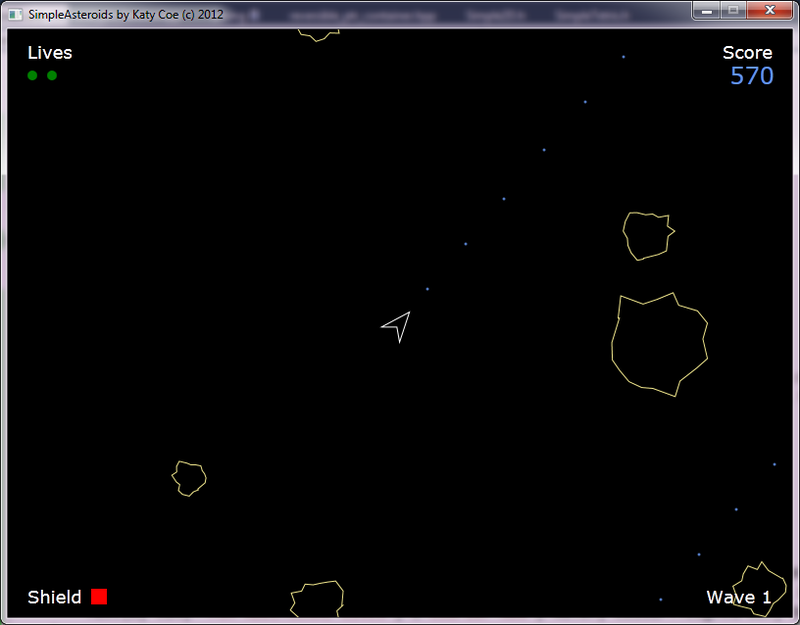 So far so good, but when you destroy all the asteroids you’re now just left with a ship and a blank screen! 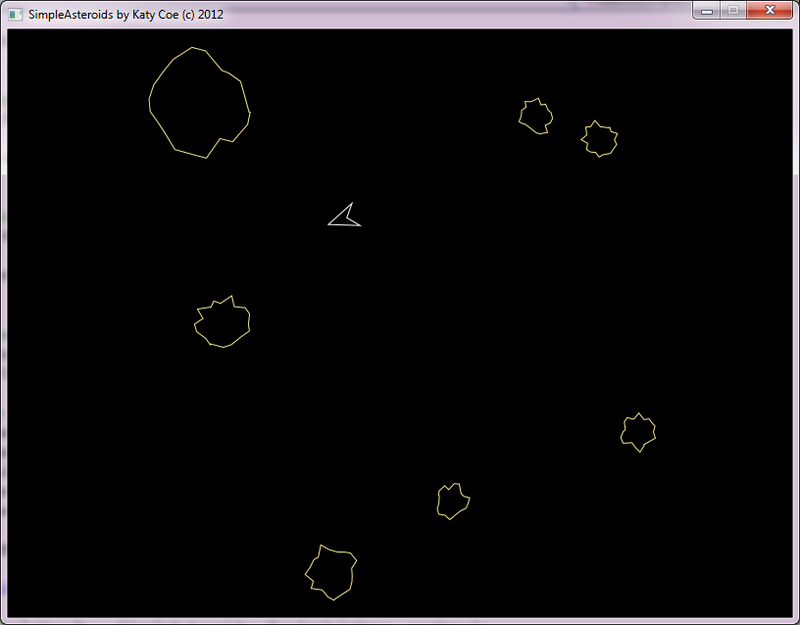 Plus, what if you re-spawn while there is an asteroid in the middle of the screen? You’ll die instantly. These are the remaining two problems to address in the challenge. // Update movement, status etc. Note the call to the base function at the end to ensure the ship’s speed and position is still updated. Note once again that this for loop is a hideously bad way for checking how many asteroids are left, a result of poor design, and again indicates that a family of homogeneous containers would have been better than a single heterogeneous one – or alternatively, that we should keep a separate variable with a running count of how many asteroids are left and only update it when an asteroid is destroyed or a new one spawned. Yowzer that was what we call cutting it fine. VERY fine. 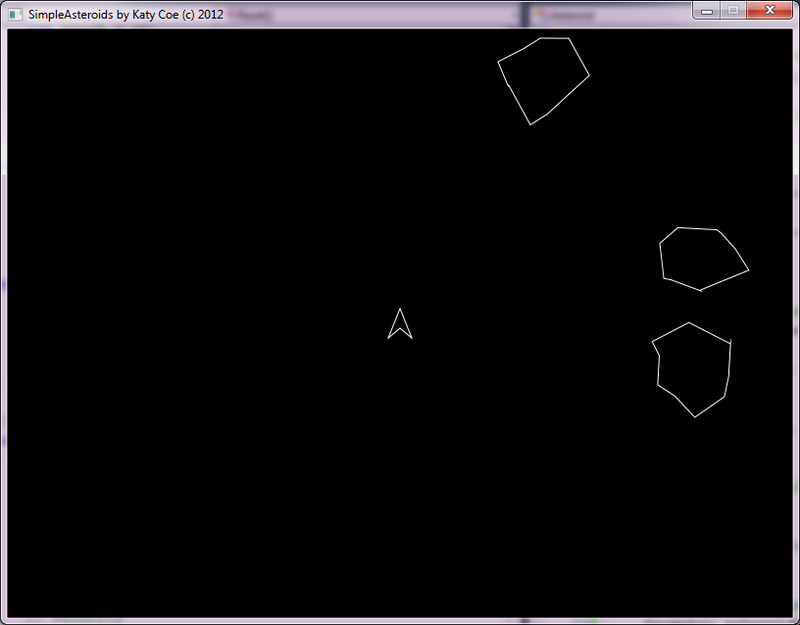 And there we have it, a fully functioning Asteroids game coded in one day. Enjoy! As earlier with the Tetris, well done with managing to finish the project. it’s user friendly to think in degrees, but for performance reasons it’s generally better to work directly in radiants. Depending of the compiler you use and the options you selected, mixing floating point and integer can result in some nasty performance issues. Technically when you multiply a floating point value by an integer, there can be rounding rules applied that may make the compiler generate some nasty float to integer to float conversion code. Better write 5.0f and be safe. As you wrote yourself, because you have anything in one single list you can afford to get very generic code, but two for loops iterating on the full list of objects makes performance drop exponentially with the number of objects. Ideally bullets should not have to check anything else that asteroids, and asteroids should not check anything else that spaceships (or the reverse). What’s your next game 🙂 ? Thanks for the great comment and tips. I’ve been out of the loop for far too long so this is a learning process for me as well. I usually work in radians, I was trying to keep it simple for beginners, I remember when I was a teenager having trouble equating that PI/2 = 90 degrees. Thanks for the tip on int casting, I will change the code and bear that in mind for later. On the classes, that iteration code is absolutely horrible, it’s easily the worst part of the code by miles. I got backed into a corner with time constraints preventing me from re-designing it, but that is going to be one of the first topics I address in the next article on the subject. Next game… I’ve been challenged to write Donkey Kong or equivalent, which I think is probably a good idea since platformers present their own set of challenges. I compile the code, and get a exe, but the ship does not show the bullets when it fires, I can see the effects (rocks break up), but no bullets are visible….also it appears the ship gets hit by asteroids while the visuals don’t show that. any ideas? Game seems to work well other than no bullets and oddly getting killed seemingly at random. Hoping to use your code in a mentoring programming class I’m doing after school with kids. Sorry for the late reply, I thought I would get a email with the response….Yes the precompiled exe runs perfectly! Which really has me stumped…. (annoying its your copyright line! sorry about that, I’ll put back once I figure this out). Could I be using the wrong version of Simple2D??? I downloaded the latest was the SetWindowName function removed? One red flag when I see this for any multimedia app: write it in 10 hours for what? using what? If it’s meant to be portable then does that mean writing the real-time multimedia code itself (rather than, say, using some OS’s API, like Windows multimedia? If not, does it port to Linux then? Or Mac? Or Android (or as an Apple app?) If the API is something assumed to already be there then the floodgates are open and you might as well import the game engine too. Better yet: go to Findlay’s LCC-Win compilers archive (http://www.johnfindlay.plus.com/lcc-win32/), get the Donuts source (under DirectX) and modify it to do Asteroids (maybe adding in the C++ source for Asteroids from BigAngryDog). BigAngryDog’s stuff works with QT, which I think has ports to a variety of systems. Better yet: do a *fusion* of Asteroids and Donuts (and BigAngryDog’s Asteroids). For related reasons, portability of the graphics engine wasn’t a concern during this. The actual game logic presented in the article can be taken and re-applied in Box2D, Unity, Cocos2D or any other engine of the learner’s choice – hopefully! I forgot to add: BigAngryDog’s “Asteroids Cresta” won’t work under Linux’s “Wine” Windows emulator, though Microsoft’s Direct X demo “Donuts” will. Cresta has to be recompiled with a Linux port of QT. As for your source I may give it a try and see if it runs under Windows emulation on Linux. I just want to tell you that the links dont work, it doesnt download the page, just for you to know.